Alzheimer’s disease is one of the most common causes of mental deterioration in elderly people, accounting for around 50%-60% of the overall cases of dementia among persons over 65 years of age. The past two decades have witnessed a considerable research effort directed towards discovering the cause of Alzheimer’s disease with the ultimate hope of developing safe and effective pharmacological treatments. This article examines the existing scientific applicability of the original cholinergic hypothesis of Alzheimer’s disease by describing the biochemical and histopathological changes of neurotransmitter markers that occur in the brains of patients with Alzheimer’s disease both at postmortem and neurosurgical cerebral biopsy and the behavioural consequences of cholinomimetic drugs and cholinergic lesions. Such studies have resulted in the discovery of an association between a decline in learning and memory, and a deficit in excitatory amino acid (EAA) neurotransmission, together with important roles for the cholinergic system in attentional processing and as a modulator of EAA neurotransmission. Accordingly, although there is presently no “cure” for Alzheimer’s disease, a large number of potential therapeutic interventions have emerged that are designed to correct loss of presynaptic cholinergic function. A few of these compounds have confirmed efficacy in delaying the deterioration of symptoms of Alzheimer’s disease, a valuable treatment target considering the progressive nature of the disease. Indeed, three compounds have received European approval for the treatment of the cognitive symptoms of Alzheimer’s disease, first tacrine and more recently, donepezil and rivastigmine, all of which are cholinesterase inhibitors. Alzheimer’s disease affects an estimated 15 million people worldwide and is the leading cause of dementia in elderly people. With the proportion of elderly people in the population increasing steadily, the burden of the disease, both to carers and national economies, is expected to become substantially greater over the next 2 to 3 decades. The systematic biochemical investigation of the brains of patients with Alzheimer’s disease began in the late 1960s and early 1970s. The hope was that a clearly defined neurochemical abnormality would be identified, providing the basis for the development of rational therapeutic interventions analogous to levodopa treatment of Parkinson’s disease. Support for this perspective came in the mid-1970s with reports of substantial neocortical deficits in the enzyme responsible for the synthesis of acetylcholine (ACh), choline acetyltransferase (ChAT).2-4 Subsequent discoveries of reduced choline uptake,5 ACh release6 and loss of cholinergic perikarya from the nucleus basalis of Meynert7 confirmed a substantial presynaptic cholinergic deficit. Schematic diagram of a neuron representing (A) alterations in neurotransmission in Alzheimer’s disease and (B) the hypothetical mode of action of AChE inhibitors. Key to figure (A): (1) reduced cortical cholinergic innervation; (2) reduced corticocortical glutamatergic neurotransmission due to neuron or synapse loss; (3) reduced coupling of muscarinic M1 receptors to second messenger system? ; (4) shift of tau to the hyperphosphoryalted state—precursor of neurofibrillary tangles; (5) reduced secretion of soluble APP; (6) increased production of β-amyloid protein; (7) decreased glutamate production. *It is hypothesised that these changes give rise to the clinical symptoms of Alzheimer’s disease and contribute to the spread of pathology.12 49 54 Key to figure B: (1) AChE inhibitors reduce the breakdown of endogenously released ACh, resulting in greater activation of postsynaptic ACh receptors; hypothesised consequences: (2) reduced phosphorylation of tau; (3) secretion of sAPP returned towards normal; (4) reduced β-amyloid production; (5) glutamatergic neurotransmission returns towards normal, possibly due to activation of muscarinic and nicotinic receptors. ACh=acetylcholine; mAChR=ACh muscarinic receptor; APP=a myloid precursor protein; AChE=acetylcholinesterase; nAChR=ACh nicotinic receptor; Glu=glutamate. (1) Setting the original findings of reduced cholinergic neurotransmission in the context of changes in other neurotransmitter systems, a clear understanding of the behavioural role of the cholinergic system, and a more detailed understanding of the molecular pathology of the disease. (2) Charting the preclinical and clinical development of cholinomimetic drugs for the symptomatic treatment of Alzheimer’s disease, focusing on the first generation and second generation cholinesterase inhibitors currently available. The discovery that rare mutations in the gene encoding for APP always led to Alzheimer’s disease in family members carrying the defect resulted in the proposal of the “amyloid cascade hypothesis” of Alzheimer’s disease.46 Thus, the mismetabolism of APP leading to increased production of β-amyloid was proposed as the critical event in both familial and sporadic Alzheimer’s disease with other changes, tangles, neuron loss, synapse loss, and neurotransmission dysfunction, following as a consequence. Cholinergic neurotransmission may be a specific target for β-amyloid, as it has been shown to reduce both choline uptake and ACh release in vitro.47 48 It is of interest here that disease related changes in the Alzheimer’s disease brain are focused on pyramidal neurons in that these cells are lost in the disease, subject to tangle formation, represent a major source of APP (and hence, a site for its mismetabolism leading to increased β-amyloid production) and are regulated by a neurotransmitter (ACh), affected early in the disease. These neurons therefore seem to have a central role in the clinical symptoms as well as in the pathophysiology of the disease. Observations in cell lines and primary neuronal cultures that the activation of muscarinic, metabotropic glutamate, and other phospholipase C-linked receptors favours the non-amyloidogenic processing of APP49 suggests that compounds being developed for symptomatic treatment may have a serendipitous effect on the continuing emergence of pathology by reducing the production of β-amyloid. Furthermore, β-amyloid neurotoxicity is attenuated by muscarinic agonists.50 No data have yet been reported regarding the potential beneficial effects of cholinomimetic drugs on either increasing APP or reducing β-amyloid production in patients with Alzheimer’s disease. There is, however, some evidence for reductions in CSF fluid APP in depressed patients receiving drugs with anticholinergic side effects.51 Clearly, long term studies are called for to test this hypothesis in the patient population. However, this may raise ethical problems—for example, the need for serial lumbar puncture and the justification for groups of patients to act as placebo controls. Other studies have shown that the phosphorylation of tau, thought to be an important step in the formation of tangles (which occur predominately in EAA cortical pyramidal neurons), may also be influenced by the phospholipase C second messenger system.52 Thus, after muscarinic cholinergic receptor stimulation, activation of protein kinase C may lead to the inactivation of a protein kinase (GSK-3) which phosphorylates tau, in vitro, in a similar manner to that found in Alzheimer’s disease.52 In support of this tenet, neuronal cells in culture transfected with M1 muscarinic receptors show reduced phosphorylation of tau after treatment with cholinergic agonists.53 Therefore, as a consequence of reduced cholinergic activity, reduced activation of protein kinase C may lead to a higher level of activity of GSK-3 and hence hyperphosphorylation of tau. Thus, if these neurotransmitter-protein interactions occur in the Alzheimer’s disease brain, it is not inconceivable that the changes in the balance of neurotransmission in the Alzheimer’s disease brain may contribute to increased tau phosphorylation and β-amyloid production and hence neurodegeneration in selectively vulnerable regions. Furthermore, it is possible that ChE inhibitors may reduce the histopathological features of disease progression. On the basis of recent studies of Alzheimer’s disease, a glutamatergic hypothesis of Alzheimer’s disease has been proposed as an auxiliary to the cholinergic hypothesis.12 54 Thus, the cholinergic hypothesis may be refined to include the idea that a major target of cholinomimetic action is EAA pyramidal neurons, and that cholinergic hypofunction compounds the loss of EAA function. Together these systems may be largely responsible for the neuropsychological deficits and may contribute to the continuing emergence of pathology in patients with Alzheimer’s disease. This revised cholinergic hypothesis provides a stronger case for the continued development of cholinomimetic drugs for the symptomatic treatment of Alzheimer’s disease. Many pharmacological studies have examined the effect of cholinomimetic drugs and cholinergic receptor antagonists on learning and memory tasks. The most commonly used model is based on the finding that scopolamine, a muscarinic receptor antagonist, induces amnesia in young healthy subjects comparable with that in old, untreated subjects.8 These deficits may be reversed by ChE inhibitors. Compounds that reverse these scopolamine induced deficits in experimental animals may be considered as potential drugs to treat cognitive impairment. A prediction of the cholinergic hypothesis is that drugs that potentiate central cholinergic function should improve cognition and perhaps even some of the behavioural problems experienced with Alzheimer’s disease. There are a number of approaches to the treatment of the cholinergic deficit in Alzheimer’s disease, most of which have initially focused on the replacement of ACh precursors (choline or lecithin) but these agents failed to increase central cholinergic activity. Other studies have investigated the use of ChE inhibitors that reduce the hydrolysis of ACh (figure, B)—for example, physostigmine. More recent investigational compounds include specific M1 muscarinic or nicotinic agonists, M2 muscarinic antagonists, or improved “second generation” ChE inhibitors (table). Additional potential symptomatic therapeutic avenues relevant to the cholinergic hypothesis of Alzheimer’s disease have resulted from the rapid development in the understanding of the molecular pathology of the disease. For example, during the development of cholinergic neurons in the basal forebrain, they express functional nerve growth factor (NGF) receptors. In adult life, these neurons seem to remain responsive to NGF. Consequently, intraventricular administration of NGF has been shown to prevent the lesion induced loss of cholinergic neuronal cell bodies and to accelerate the recovery of behavioural deficits in learning.67 Another approach is the transplantation of ACh rich foetal tissue grafts, which has been shown to improve the cognitive performance of primates after excitotoxic lesions of cholinergic nuclei.68 Thus, although such approaches may provide additional future possibilities for the palliative treatment for Alzheimer’s disease, the use of ChE inhibitors is the most well developed approach to treatment to date. The principal influence of the mechanism of action of enzyme inhibitors in the clinic relates to their duration of action. A more theoretical issue is the effect of pronounced non-competitive inhibition on the rate of enzyme synthesis. Non-competitive inhibitors may produce only slowly reversible ChE inhibition. The rate at which this inhibition is reversed may be of the same order as the rate of enzyme synthesis.76 Thus, the long term effects of administration of slowly reversible, or irreversible, inhibitors on the overall cholinergic function are difficult to predict. Among the other unwanted side effects of tacrine, the most often occurring are those caused by overstimulation of the peripheral cholinergic system at or below 30% ChE inhibition reflecting its dose related tolerability.94 These side effects are manifested predominantly by gastrointestinal tract discomfort and overactivity, resulting in nausea, vomiting, abdominal pain, and diarrhoea. Doses of tacrine within the therapeutic range elicit such side effects in about 20% of tacrine treated patients.95 In one 30 week clinical trial, over 50% of patients treated with tacrine discontinued treatment because of cholinergic related side effects. In addition, over 70% of patients titrated to the highest dosage of tacrine (160 mg/day) failed to complete this 30 week study.91 These incidental effects limit the compound’s maximum tolerated dose that may be administered to patients, and therefore the extent of brain AChE inhibition that can be achieved. Despite these limitations, a substantial number of patients, some 250 000–300 000 worldwide, have been exposed to tacrine. Consequently, although tacrine produces a meaningful benefit in a significant proportion of patients with Alzheimer’s disease, the question has been raised as to whether this approach represents a fair test of the cholinergic hypothesis. This issue has been considered in the development of “second generation” ChE inhibitors. Such ChE inhibitors have been designed to limit side effect problems, and the maximum tolerated dose that can be achieved may be determined more by the effects of ChE inhibition itself. Diagnostic inaccuracy, which may be as high as 20%, can produce a strong bias in favour of non-response when the results in different treatment arms are “averaged out”. The heterogeneity of Alzheimer’s disease at a genetic, clinical, neurochemical, and neuropathological level may also contribute to differing response rates. Thus, whereas some patients, of course, respond considerably more than the mean reported in clinical trials, others similarly, will respond less. It may prove difficult to develop one therapy with an equivalent effect across the disease range of stage and severity. However, it may be possible to define patients by genotype, or by other markers, and tailor treatment to specific clinical subtypes, and work is underway to explore this possibility. Response rates of ChE inhibitors do not detract from their clinical importance, as ChE inhibitors provide meaningful and important benefits for some patients with Alzheimer’s disease and their families. There is no doubt now that significant proportions of patients with probable mild to moderate Alzheimer’s disease gain some benefit from ChE inhibitors. In qualitative terms, a delay in symptomatic decline by about 6–12 months is valuable to those with Alzheimer’s disease, and also to those that care for and about them. At an anecdotal level, individual patients that have been treated successfully, and their relatives have reported improved awareness and attention, greater motivation and independence, improved language and communication abilities, and an improvement in the ability to undertake previously impaired or abandoned ADLs and hobbies. For example, a good response can include such features as the patient being able, once again, to manage their own day to day activities, being able to make and take telephone calls spontaneously, undertake their hobbies and pastimes and, in some cases, even to go shopping and successfully return with the required goods without having become lost. Finally, evidence is emerging from clinical trials of cholinomimetic drugs that such drugs may improve the abnormal non-cognitive, behavioural symptoms of Alzheimer’s disease. Thus, ChE inhibitors have been reported to significantly improve many manifestations of behavioural disturbance including agitation, apathy, hallucinations, and aberrant motor behaviour101 109 and xanomeline, a selective muscarinic agonist, has been shown to improve vocal outbursts and psychotic symptoms.110 Further, such long term treatment with ChE inhibitors may delay or reduce the need for nursing home placement, and even reduce mortality (a trend for reduced mortality has been noted with tacrine).111 These findings require confirmation, and it will be important to establish whether this reduction in mortality increases the duration of the subsequent, more dependent stages of the disease. In addition, although nursing home placement may be delayed, the effect on the actual duration of nursing home care should be ascertained. Cholinomimetic treatment is targeted specifically at patients with Alzheimer’s disease, albeit that such treatment may be beneficial in other dementias where a cholinergic deficit also exists—for example, Lewy body disease. Trials are currently underway to explore this possibility. The severity of the dementia is another important factor to be considered as currently these drugs have been assessed adequately in patients with mild to moderately severe Alzheimer’s disease only, but again this is subject to further evaluation and current practice may change as clinical experience increases. In addition, it is essential to make a careful assessment of the patients’ illness to ensure that they are likely to have Alzheimer’s disease. Primary care physicians may screen for and recognise patients with suspected Alzheimer’s disease within the community, but often referral to a specialist service is required. As there is no definitive diagnostic test for Alzheimer’s disease, it is important to base a diagnosis of “probable Alzheimer’s disease” on careful consideration of the patients’ symptoms and signs, preferably using the Diagnostic and Statistical Manual of Mental Disorders, fourth edition (DSM IV)112 or National Institute of Neurological and Communicative Disorders and Stroke - Alzheimer’s Disease and Related Disorders Association work group (NINCDS-ADRDA) criteria,113 or an equivalent protocol. If properly applied, the accuracy rate of diagnosis using such criteria, confirmed at necropsy, probably varies between 85% and 95%,114 115 depending on the experience of the centre in which the patient is assessed. Less than half of the patients receiving ChE inhibitors achieve a clinically significant response, although no further deterioration or even a slowing of deterioration are desirable outcomes, given the progressive, degenerative nature of the disease. Nevertheless, all patients with Alzheimer’s disease should have the opportunity of a treatment trial of at least 3 months in duration. Unfortunately, however, it has not yet been possible to predict or distinguish responders from non-responders. In clinical trials, various psychometric outcome measures are used to assess the efficacy of drug treatment for Alzheimer’s disease. The cognitive subscale of the ADAS-cog and the CIBIC are used often to determine the efficacy of pharmacological agents. The ADAS-cog measures memory, orientation, attention, language, function, and praxis. CIBIC measures patients’ global function in terms of general, cognitive, behavioural, and ADL domains (for example, personal care and hobbies), and is determined by experienced clinicians, but may incorporate input from the primary caregiver of the patient with Alzheimer’s disease (for example, the CIBIC plus). A further assessment, the mini mental state examination (MMSE),116 is a short collection of cognitive tests that examines several areas of cognition. It is widely used to measure the onset, progression, and severity of Alzheimer’s disease in the clinical setting. The test is easy to administer and score, and can be used readily in a primary care setting, both at the office and in the patient’s home. The cholinergic hypothesis of Alzheimer’s disease is based on the presynaptic deficits found in the brains of patients with Alzheimer’s disease and studies of the role of ACh in animal and human behaviour. Although it is now clear that cholinergic dysfunction may not cause cognitive impairment directly, but rather indirectly, by interfering with attentional processing, the hypothesis predicted that cholinomimetic drugs would improve cognitive function. This prediction was not fully realised with compounds such as physostigmine and tacrine, probably because the emergence of side effects that may have constrained the dosing regimen to sub-efficacious doses. Poor tolerability seems to be less of an issue for the second generation compounds of the type now being licensed for the treatment of Alzheimer’s disease. With improved diagnosis, careful patient selection, and fewer side effects, such compounds will establish if cholinomimetic therapy provides effective and long lasting palliative therapy. Moreover, the emerging relation between neurotransmission and metabolism of two key proteins involved in Alzheimer’s disease, APP and tau, raises the possibility that second generation ChE inhibitors may alter disease pathology and progression. Work on this manuscript was supported by an educational grant from Eisai Inc and Pfizer Pharmaceuticals Group, Pfizer Inc. We thank PPS International, Worthing, UK, for their assistance in the development of this manuscript and Drs K Stanhope and M Sheardown for helpful discussion. (1996) The basis for behavioural disturbances in dementia. J Neurol Neurosurg Psychiatry 61:127–130. (1976) Neurotransmitter-related enzymes and indices of hypoxia in senile dementia and other abiotrophies. Brain 99:459–496. (1976) Selective loss of central cholinergic neurones in Alzheimer’s disease. Lancet ii:1403. (1977) Neurotransmitter enzyme abnormalities in senile dementia. Choline acetyltransferase and glutamic acid decarboxlyase activities in necropsy brain tissue. J Neurol Sci 34:247–265. (1983) Evidence for high affinity choline transport in synaptosomes prepared from hippocampus and neocortex of patients with Alzheimer’s disease. Brain Res 289:169–175. (1986) Physostigmine restores [3H]-acetylcholine efflux from Alzheimer brain slices to normal level. J Neural Transm 67:275–285. (1982) Alzheimer’s disease and senile dementia: loss of neurones in basal forebrain. Science 215:1237–1239. (1974) Human memory and the cholinergic system. Arch Neurol 30:113–121. (1982) The cholinergic hypothesis of geriatric memory dysfunction. Science 217:408–417. (1996) Pyramidal nerve cell loss in Alzheimer’s disease. Neurodegeneration 5:423–427. (1996) Structural correlates of cognition in dementia: quantification and assessment of synapse change. Neurodegeneration 5:417–421. (1993) Cortical pyramidal neurone loss may cause glutamatergic hypoactivity and cognitive impairment in Alzheimer’s disease: investigative and therapeutic perspectives. J Neurochem 60:1589–1604. (1978) Correlation of cholinergic abnormalities with senile plaques and mental test scores in senile dementia. BMJ 2:1457–1459. (1982) Alzheimer’s disease. Correlation of cortical choline acetyltransferase activity with the severity of dementia and histological abnormalities. J Neurol Sci 57:407–417. (1983) Presynaptic cholinergic dysfunction in patients with dementia. J Neurochem 40:503–509. (1982) A postmortem study of the cholinergic and GABA systems in senile dementia. Brain 105:313–330. (1990) Antemortem cerebral amino acid concentrations indicate selective degeneration of glutamate-enriched neurons in Alzheimer’s disease. Neuroscience 38:571–577. (1986) Iversen LL. Non-cholinergic neurotransmitter abnormalities in Alzheimer’s disease. Br Med Bull 42:70–44. (1987) Somatostatin content and release measured in cerebral biopsies from demented patients. J Neurol Sci 78:1–16. (1988) Possible neurotransmitter basis of behavioural changes in Alzheimer’s disease. Ann Neurol 23:616–620. (1996) Presynaptic serotonergic markers in community-acquired cases of Alzheimer’s disease: correlation with depression and neuroleptic medication. J Neurochem 66:1592–1598. (1982) Choline acetyltransferase activity and histopathology of frontal neocortex from biopsies of demented patients. J Neurol Sci 57:191–202. (1986) Alzheimer’s disease: a correlative study. J Neurol Neurosurg Psychiatry 49:229–237. (1986) Excitatory amino acid-releasing and cholinergic neurones in Alzheimer’s disease. Neurosci Lett 66:199–204. (1989) Non-Alzheimer-type pattern of brain choline acetyltransferase reduction in dominantly inherited olivopontinecerebellar atrophy. Ann Neurol 26:362–367. (1988) Reductions in acetylcholine and nicotine binding in several degenerative diseases. Arch Neurol 45:722–724. (1992) Nicotinic and muscarinic subtypes in the human brain: changes with aging and dementia. J Neurosci Res 31:103–111. (1993) Coupling of muscarinic receptors to GTP proteins in postmortem human brain—alterations in Alzheimer’s disease. Neurosci Lett 150:39–43. (1995) Changes in cortical nicotinic acetylcholine receptor numbers following unilateral destruction of pyramidal neurones by intrastriatal volkensin injection. Neurodegeneration 4:415–424. (1985) Two types of muscarinic responses to acetycholine in mammalian cortical neurones. Proc Natl Acad Sci USA 82:6344–6348. (1986) M-current in human neocortical neurones. Neurosci Lett 67:1–6. (1995) Cholinomimetics increase glutamate outflow by an action on the corticostriatal pathway: implications for Alzheimer’s disease. J Neurochem 65:2165–2169. (1987) Alzheimer’s disease: glutamate depletion in the hippocampal perforant pathway zone. Ann Neurol 22:37–40. (1988) Evidence of glutamatergic denervation and possible abnormal metabolism in Alzheimer’s disease. J Neurochem 50:790–802. (1994) APP isoforms show correlations with neurones but not with glia in brains of demented subjects. Acta Neuropathol 88:545–552. (1996) Neurochemical correlates of dementia. Neurodegeneration 5:403–407. (1983) An overview of light and electron microscopic changes in Alzheimer’s disease, the standard reference. (Macmillan, New York), pp 37–47. (1987) Laminar and regional distributions of neurofibrillary tangles and neuritic plaques in Alzheimer’s disease a quantitative study of visual and auditory cortices. J Neurosci 7:1799–1809. (1996) Brain energy metabolism, cognitive function and down-regulated oxidative phosphorylation in Alzheimer disease. Neurodegeneration 5:473–476. (1990) Psychometrics and their correlation with physical aspects of the Alzheimer’s brain. Neurobiol Aging 11:266. (1982) Plaques, tangles and dementia. J Neurol Sci 56:343–356. (1988) Biochemical measurements in Alzheimer’s disease reveal a necessity for improved neuroimaging techniques to study metabolism. Biochem J 251:305–308. (1987) Intravenous physostigmine treatment of Alzheimer’s disease evaluated by psychometric testing, regional cerebral blood flow (rCBF) measurement, and EEG. Psychopharmacology 93:31–35. (1990) Effect of central cholinergic stimulation on regional cerebral blood flow in Alzheimer’s disease. Lancet 335:1484–1487. (1991) Amyloid deposition as the central event in the aetiology of Alzheimer’s disease. Trends Pharmacol Sci 12:383–388. (1998) Amyloid β-peptide inhibits high-affinity choline uptake and acetylcholine release in rat hippocampal slices. J Neurochem 70:2179–2187. (1998) β-Amyloid peptides as direct cholinergic neuromodulators: a missing link? Trends Neurosci 21:43–49. (1996) From acetylcholine to amyloid: neurotransmitters and the pathology of Alzheimer’s disease. Neurodegeneration 5:477–482. (1997) New perspectives on developing muscarinic agonists for treating Alzheimer’s disease. ID Research Alert 2:187–194. (1993) β-Amyloid precursor protein-like immunoreactivity can be altered in humans by drugs affecting neurotransmitter function. Neurodegeneration 2:243–248. (1994) Alzheimer’s disease-like phosphorylation of the microtubule-associated protein tau by glycogen synthase kinase-3 in transfected mammalian cells. Curr Biol 4:1077–1086. (1996) Activation of m1 muscarinic acetylcholine receptor regulates tau phosphorylation in transfected PC12 cells. J Neurochem 66:877–880. (1990) Is the neurochemical basis of Alzheimer’s disease cholinergic or glutamatergic? FASEB 4:2745–2752. (1992) Effects of cholinergic and non-cholinergic drugs on visual discrimination and delayed visual discrimination performance in rats. Psychopharmacology 106:523–530. (1998) Effects of the potassium channel blockers, apamin and 4-aminopyridine, on scopolamine-induced deficits in the delayed matching to position task in rats: a comparison with the cholinesterase inhibitor E2020. Psychopharmacology 135:242–255. (1995) Dissociation between cognitive and motor/motivation deficits in the delayed matching to position test: effects of scopolamine, 8-OH-DPAT and EAA antagonists. Psychopharmacology 122:268–280. (1986) Scopolamine and the control of attention in humans. Psychopharmacology 89:94–97. (1993) Cholinergic control of cognitive resources. Neuropsychobiology 28:43–46. (1988) Place navigation in rats is impaired by lesions of medial septum and diagonal band but not nucleus basalis magnocellularis. Behav Brain Res 27:9–20. (1989) Selective fimbra lesions impair acquisition of working and reference memory of rats in a complex spatial discrimination task. Behav Brain Res 32:151–161. (1991) The basal forebrain-cortical cholinergic system: interpreting the functional consequences of excitotoxic lesions. Trends Neurosci 14:494–501. (1992) Pharmacological mechanisms and animal models of cognition. Behav Pharamacol 3:285–297. (1994) AMPA-induced excitotoxic lesions of the basal forebrain—a significant role for the cortical cholinergic system in attentional function. J Neurosci 14:2313–2326. (1995) Reversal of visual attentional dysfunction following lesions of the cholinergic basal forebrain by physostigmine and nicotine but not by the 5-HT3 receptor antagonist, ondansetron. Psychopharmacology 118:82–92. (1994) Nicotine and tetrahydroaminoacridine: evidence for improved attention in patients with dementia of the Alzheimer type. Drug Dev Res 31:80–88. (1995) Neuronal growth factors and Alzheimer’s disease. in Neurobiology of Alzheimer’s disease. eds Dawbarn D, Allen SJ (Bios Scientific Publishers, Bristol), pp 249–259. (1995) Cholinergic grafts in primates: the role of ACh in cognition. in Neurobiology of Alzheimer’s disease. eds Dawbarn D, Allen SJ (Bios Scientific Publishers, Bristol), pp 223–242. (1995) Kinetic study on the inhibition of acetylcholinesterase by 1-benzyl-4-[(5,6-dimethoxy-l-indanon)-2-yl] methylpiperidine hydrochloride (E2020). Biol Pharm Bull 18:1145–1147. (1991) The pharmacology of a piperidine cholinesterase inhibitor. in Cholinergic basis for Alzheimer therapy. eds Becker R, Giacobini E (Birkhäuser, Boston), pp 314–320. (1996) A comparison of the cholinesterase-inhibitors tacrine and E-2020. Br J Pharmacol 117:P163. (1990) Reversibility of the inhibition of acetylcholinesterase by tacrine. Neurosci Lett 118:85–87. (1992) Inhibition of human brain and RBC acetylcholinesterase (AChE) by heptylphysostigmine (HPTL). Methods Find Exp Clin Pharmacol 14:615–621. (1991) Pharmacodynamics of oral E2020 and tacrine in humans: novel approaches. in Cholinergic basis for Alzheimer therapy. eds Becker R, Giacobini E (Birkhäuser, Boston), pp 321–328. (1996) Current cholinergic therapy for symptoms of Alzheimer’s disease. Primary Psychiatry 3:56–68. (1978) Acetylcholinesterase resynthesis after DFP poisoning: histochemical and biochemical study. Acta Histochem 62:293–301. (1991) The cholinesterases. J Biol Chem 266:4025–4028. (1991) In vitro effects of various cholinesterase inhibitors on acetyl- and butyrylcholinesterase of healthy volunteers. Biochem Pharmacol 41:139–141. (1995) Synthesis and structure-activity relationships of acetylcholinesterase inhibitors – 1-benzyl-4-[(5,6-dimethoxy-1-oxoindan-2-yl) methyl]piperidine hydrochloride and related compounds. J Med Chem 38:4821–4829. (1989) The cholinergic pharmacology of tetrahydroaminoacridine in vivo and in vitro. Br J Pharmacol 98:79–86. (1993) 3-Dimensional structure of acetylcholinesterase and of its complexes with anticholinesterase drugs. Chem Biol Interact 87:187–197. (1993) Quaternary ligand-binding to aromatic residues in the active-site gorge of acetylcholinesterase. Proc Natl Acad Sci USA 90:9031–9035. (1994) Blockade of nicotinic responses by physostigmine, tacrine and other cholinesterase-inhibitors in rat striatum. Br J Pharmacol 111:695–702. (1987) Do tetrahydroaminoacridine (THA) and physostigmine restore acetylcholine-release in Alzheimer brains via nicotinic receptors? J Neural Transm Suppl 70:357–368. (1988) Interaction of 9-amino-1,2,3,4-tetrahydroamino-acridine (THA) with human cortical nicotinic and muscarinic receptor-binding in vitro. Neurosci Lett 91:211–216. (1988) Effects of tetrahydroaminoacridine on M1 and M2 muscarine receptors. Neurosci Lett 88:281–285. (1996) Effects of MF-268, a new cholinesterase inhibitor, on acetylcholine and biogenic-amines in rat cortex. J Neurosci Res 43:120–126. (1991) Measurements of tacrine and monoamines in brain by in vivo microdialysis argue against release of monoamines by tacrine at therapeutic doses. Br J Pharmacol 103:1946–1950. (1992) A double-blind, placebo-controlled multicenter study of tacrine for Alzheimer’s disease. N Engl J Med 327:1253–1259. (1992) A controlled trial of tacrine in Alzheimer’s disease. The Tacrine Study Group. JAMA 268:2523–2529. (1994) A 30-week randomized controlled trial of high-dose tacrine in patients with Alzheimer’s disease. The Tacrine Study Group. JAMA 271:985–991. (1995) Clinical heterogeneity: responders to cholinergic therapy. Alzheimer Dis Assoc Disord 9 (suppl 2) 37–42. (1994) Long-term use of tacrine [letter]. Lancet 11:567–571. (1991) The second generation of cholinesterase inhibitors: clinical and pharmacological effects. in Cholinergic basis for Alzheimer therapy. eds Becker RE, Giacobini E (Birkhäuser, Boston), pp 263–296. 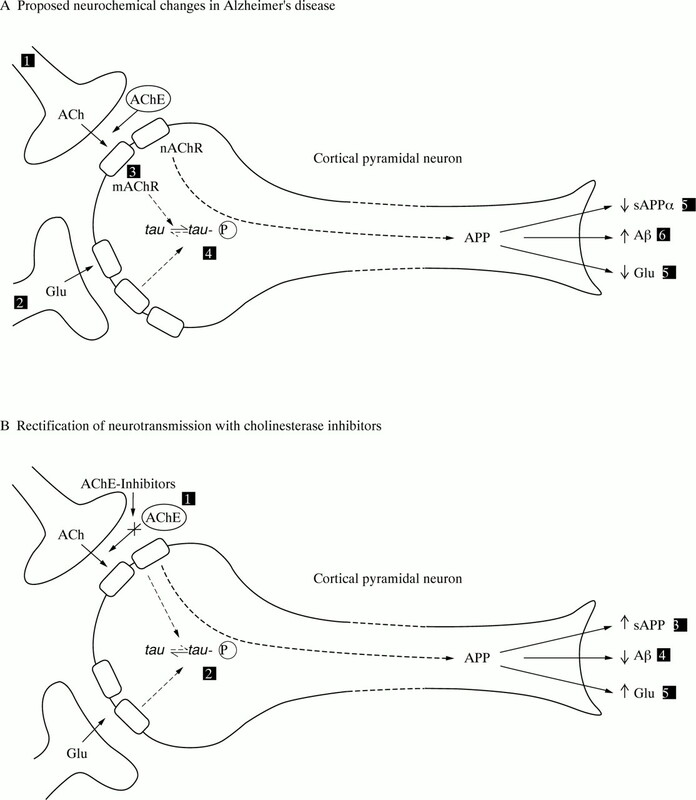 (1993) Clinical pharmacology of aminoacridines in Alzheimer’s disease. Neurology 43 (suppl 14) S64–S79. (1996) The efficacy and safety of donepezil in patients with Alzheimer’s disease: results of a US multicenter, randomized, double-blind, placebo-controlled trial. Dementia 7:293–303. and the Donepezil Study Group. (1998) A 24-week, double-blind, placebo-controlled trial of donepezil in patients with Alzheimer’s disease. Neurology 50:136–145. and the Donepezil Study Group. (1998) Donepezil improves cognition and global function in Alzheimer’s disease: a 15-week, double-blind, placebo-controlled study. Arch Int Med 158:1021–1031. and the Donepezil Study Group. (1998) A randomized trial evaluating the efficacy and safety of ENA 713 (rivastigmine tartrate), a new acetylcholinesterse inhibitor, in patients with mild to moderately severe Alzheimer’s disease. Int J Geriatr Psychopharmacol 1:55–65, for the ENA 713 B352 Study Group. (1998) Metrifonate treatment of the cognitive deficits of Alzheimer’s disease. Neurology 50:1214–1221. (1998) Metrifonate benefits cognitive, behavioral, and global function in patients with Alzheimer’s disease. Neurology 50:1222–1230. (1998) Metrifonate for Alzheimer’s disease. Is the next cholinesterase inhibitor better? Neurology 50:1203–1205. (1996) Galanthamine. Drugs Aging 9:60–65. (1984) A new rating scale for Alzheimer’s disease. Am J Psychiatry 141:1356–1364. (1997) Validity and reliability of the Alzheimer’s Disease Cooperative Study-Clinical Global Impression of Change. Alzheimer Dis Assoc Disord 11 (suppl 2) S22–S32. (1997) Donepezil lengthens time to loss of activities of daily living in patients with mild to moderate Alzheimer’s disease—results of a preliminary evaluation. Neurology 48:A100, (P02.026)..
(1998) Long-term efficacy and safety of donepezil in the treatment of Alzheimer’s disease: an interim analysis of the results of a US multicentre open label extension study. Eur Neuropsychopharmacol 8:67–75. (1993) Pharmacokinetics of E2020, a new compound for Alzheimer’s disease, in healthy male volunteers. Int J Clin Pharmacol Ther Toxicol 31:223–229. (1998) Donepezil in Alzheimer’s disease: relative cognitive and neuropsychiatric responses and impact on caregiver distress. Neurology 50 (suppl 4) A89. (1997) Effects of xanomeline, a selective muscarinic receptor agonist, on cognitive function and behavioral symptoms in Alzheimer disease. Arch Neurol 54:465–473. (1996) Long-term tacrine (Cognex) treatment - effects on nursing-home placement and mortality. Neurology 47:166–177. (1994) Diagnostic and statistical manual of mental disorders. (APA, Washington, DC), 4th ed..
(1984) Clinical diagnosis of Alzheimer’s disease: report of the NINCDS-ADRDA work group. Neurology 34:939–944. (1994) Clinical-neuropathological correlations in Alzheimer’s disease and related dementias. Arch Neurol 51:888–895. (1995) The Consortium to Establish a Registry for Alzheimer’s Disease (CERAD). Part X. Neuropathology confirmation of the clinical diagnosis of Alzheimer’s disease. Neurology 45:461–466. (1997) Guidelines on drug treatments for Alzheimer’s disease. Lancet 350:232–233. (1998) Alzheimer’s disease—drug status update. Current Research in Alzheimer’s Disease 3:265–271.